The hypothalamus is a tiny part of the brain of vertebrate animals; in humans it weighs about four grams in a brain that weighs on average 1,400 grams (49 ounces). Despite its small size, the hypothalamus plays a pivotal role in an astounding number of functional and behavioral activities that are essential for day-to-day survival of the individual animal (or person) and for continuing survival of its species. Its overall role is to collect and integrate a huge variety of information from the body and to organize neural and endocrine responses that maintain homeostasis (constant internal environment). Carrying out this single overriding task requires coordinating the activity of the autonomic nervous system and the endocrine system, and ultimately influences several important behaviors. Thus energy metabolism is regulated by control of feeding, drinking, and digestion. Body temperature is monitored and maintained at a constant level (37 to 38°C [98.6 to 100.4°F] in humans) by a complex interplay of behavior and activity in several body systems, and reproductive behavior is coordinated with endocrine regulation of the reproductive organs. Blood pressure and composition of the blood plasma are regulated by hypothalamic mechanisms. The expression of emotions such as fear, rage, and anger are partly controlled by the hypothalamus, and it even helps regulate sleep and levels of consciousness. The hypothalamus is a thin (3 to 4 millimeters [.118 to .157 inches] in thickness) plate of neural tissue found along either side of the front end of the third ventricle (one of the fluid-filled cavities inside the brain). Deeply buried in the brain, near the center of the cranial cavity, it lies just below the thalamus (a relay center for sensory and motor pathways in the brain). It is almost completely hidden by the overlying cerebral hemisphere, although when a brain is removed for study, the hypothalamus is visible on the basal surface. The hypothalamus has a special structural and functional relationship with the pituitary gland, which dangles below it, attached by a thin stalk of nerve fibers. Important information passes along both the nerve fibers and the blood vessels of this stalk. About ten or eleven small, indistinct nuclei (nerve cell groups) are packed into the hypothalamus. Reflecting their complex and highly specialized functions, the cells here use several unusual means of cell-to-cell communication. Some hypothalamic cells are specialized to detect the presence and the concentration of large molecules such as hormones circulating in the blood and tissue fluids. They are able to do this because even the capillaries here are specialized. Unlike other brain vessels, they permit large molecules like hormones to leak into the tissues and carry signals to the neurons . Hypothalamic neurons also receive information from other body and brain areas by way of electrical impulses conducted from many sensory sources (signaling pain, vision, and blood pressure, for example) scattered through the body. Other hypothalamic neurons respond by changing their firing pattern when there are changes in the desired values of variables such as blood (body) temperature, glucose concentration, or salt concentrations in the body fluids. When the hypothalamus, using signals like those just described, establishes a need for response, hypothalamic cells influence other cells in two ways. Like other neurons, they send electrical signals (action potentials) to stimulate or inhibit cells in other regions of the brain and body. In addition, some release chemicals (hormones), usually small proteins called peptides, into the bloodstream so they can act on target cells at a considerable distance. 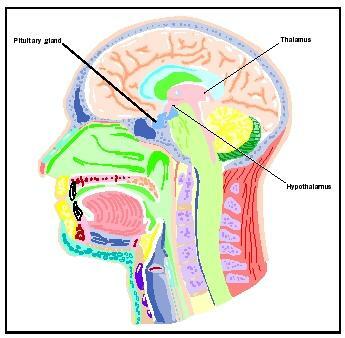 Anatomic location of the hypothalamus, in relation to the thalamus and pituitary gland. Two of the most prominent hypothalamic nuclei (because their neurons are large) are the paraventricular nucleus and supraoptic nucleus. Upon appropriate stimulation, cells in these nuclei secrete (release) two hormones into the bloodstream. Oxytocin causes uterine contraction during birth and induces milk release in females with young. Antidiuretic hormone (ADH) travels to the kidneys to help the body retain water by decreasing urinary output. Several other hypothalamic nuclei, mostly located in the anterior area, respond to several different hormones circulating in the body. When hormone levels change, cells in these nuclei release peptide signaling molecules into a special system of blood vessels that carry them to the anterior lobe of the pituitary. These peptides cause pituitary cells to either increase or decrease the secretion of one of about eight specific hormones into the bloodstream. This basic mechanism regulates blood levels of growth hormone, adrenocorticotropic hormone (for response to stress), thyrotropin (regulating basal metabolism), and the several hormones that regulate the reproductive organs and sexual behavior. Also in the anterior hypothalamus, the tiny suprachiasmatic nuclei sit atop the optic chiasm. A few optic nerve fibers from the eyes end here, informing these cells about cycles of light and darkness. Through their expansive projections to other brain areas, especially the pineal organ, these cells evoke release of the hormone melatonin into the bloodstream and thus help to regulate the body's circadian rhythms. Circadian rhythms are the cyclic, often subtle, fluctuations in many body functions that reoccur at intervals of about twenty-four hours. Cells in the anterior and posterior hypothalamic areas detect blood temperature and have connections that allow them to adjust abnormal body temperature. Neural activity in the anterior area activates systems for heat loss, dilating blood vessels of the skin and causing sweating and panting. Neurons in the posterior hypothalamus help to preserve heat by constricting blood vessels of the skin, causing shivering and slowed breathing. Still other hypothalamic nuclei work together to balance food intake. Activity in the lateral hypothalamic area encourages eating while the ventromedial nucleus (VMN) suppresses food intake. Damage to the VMN results in animals (and humans) that overeat to excess and become obese. In the preoptic area at the front end of the hypothalamus are cells that use several of the hormonal mechanisms already described to drive and regulate the menstrual cycles and other aspects of reproductive organ function and behavior. Finally, a range of behaviors characterized as rage or aggression represent physiological responses to stress; these can be seen following experimental stimulation of the dorsomedial nucleus of animals. Blood pressure and heart rate are elevated, muscles are tensed, the animals show signs of strong internal, emotional feeling. Beardsley, Tim. "Waking Up." Scientific American 275, no. 1 (2000): 14–16. Delcomyn, Fred. Foundations of Neurobiology. New York: W. H. Freeman and Company, 1998. Goldstein, Irwin. "Male Sexual Circuitry." Scientific American 282, no. 8 (2000): 70–75. Kandel, Eric R., James H. Schwartz, and Thomas M. Jessell, eds. Essentials of Neural Science and Behavior. Norwalk, CT: Appleton and Lange, 1995. Moore, Robert Y. "A Clock for the Ages." Science 284, no. 5423 (1999): 2102–2103.